Who doesn’t like to save some time and money and still eat well? These are my favorites for stretching supper. All of these can be modified for vegetarians by using tofu, TVP, or large portabella mushrooms. I hope you enjoy them! 1. Pulled pork- Will make sandwiches, tacos, and Asian lettuce wraps. I make this in the slow cooker. Just put your large pork roast in the cooker and cover with beef broth. Squirt a couple of large tablespoons of plain old ketchup. Add generous sprinkles of black pepper and garlic. Cook for at least six hours. Shred with two forks and serve with fresh buns and BBQ sauce. It’s that simple! To make into tacos, simply fill shells, top with cheese and bake until warm. Top with lettuce, tomato, onion, salsa, and sour cream. For the Asian lettuce wraps, simply add a tablespoon of hoison sauce, soy sauce, and rice wine vinegar. Sprinkle some extra garlic, and a dash of ginger. Now just wrap in lettuce leaves! 2. 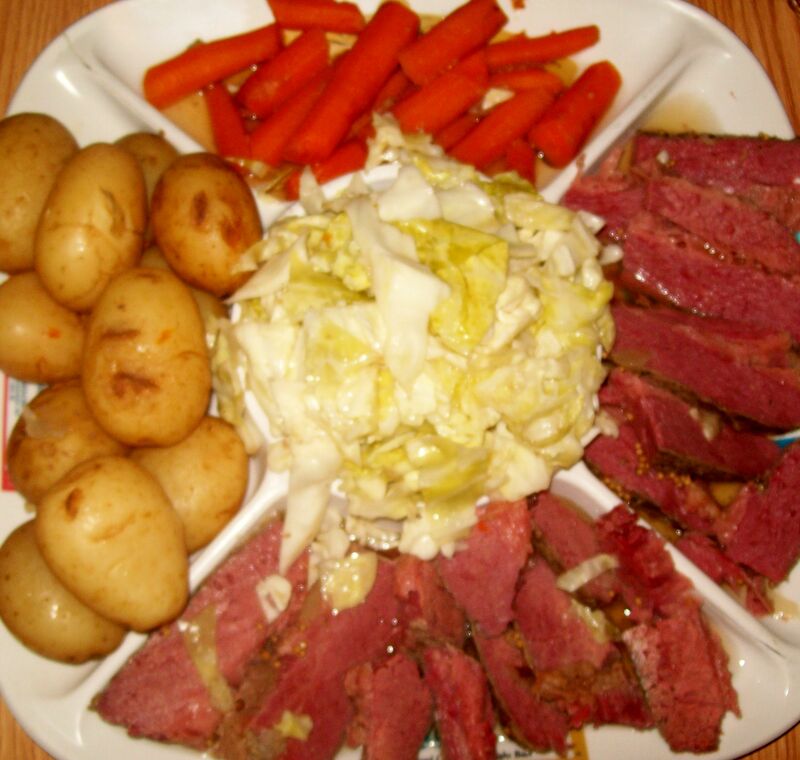 Corned beef- Will make traditional corned beef and cabbage, Reuben’s, and egg rolls. This is another slow cooker recipe. Line the bottom of your cooker with baby carrots. Next add a layer of baby potatoes. Then place large corned beef brisket on top. Almost cover with chicken broth and rub the spice packet that comes with the brisket on the meat. I like to add some extra garlic and black pepper. Allow to cook 6-8 hours. Remove everything except broth to a large baking pan and keep tightly covered in foil. Keep warm in the oven while you add shredded cabbage to your slow cooker. Turn the cooker to high and heat the cabbage in the broth for about 25 minutes. Remove with a slotted spoon and serve everything together on a platter. To make into reubens, place your already cooked cabbage in a pan with equal amount of cider vinegar and water just to cover. Add a generous sprinkle of salt and small amount of caraway seed. Boil for 25 minutes and remove with slotted spoon. Butter rye bread and place butter side down on hot frying pan. (like making a grilled cheese!) Top rye bread with thousand island dressing, corned beef slices, Swiss cheese, and the sauerkraut. Turn when bread is toasted and cheese is melted. By the way if you do not have thousand island dressing, just mix equal parts mayo and ketchup with a dash of sugar and vinegar. To make the egg rolls, chop cooked beef very fine and mix with the cabbage and some diced green onions. Roll mixture in won-ton wrappers and fry until golden brown. Serve with soy sauce. 3. Ground beef- Will make burritos, beefy noodle casserole, and sloppy Joes. Brown beef in large frying pan. Drain fat. For burritos, add enough tomato sauce to just barely coat the meat. Add generous sprinkles of salt, garlic, cayenne pepper, chili powder, cumin, black pepper, and onion powder. Roll in tortilla shells with cheese and your favorite toppings. For the noodle casserole, simply cook your noodles and mix with the meat. just add a tablespoon of butter or olive oil and some parmesan cheese. For the sloppy Joes you will want to add slightly more tomato sauce and a tablespoon or two of ketchup. Mix well and serve on warm toasty buns. 4. Roast- Will make roast beef with potatoes and carrots, French dips, and beef stew. Yet another slow cooker recipe! Line bottom of pot with carrots, next layer potatoes, then comes the roast on top. Barely cover with beef broth. Add generous amount of black pepper and garlic. Cook 6-8 hours and serve. For the French dips just slice very thin and serve on toasty French bread with beef broth for dipping. We like to melt mozzarella cheese on the top. For the beef stew, make a rue of butter and flour in a large pot. Add beef broth to make a thick and creamy stock. Then just add carrots, potatoes, and meat for a hearty and home made beef stew in less then 20 minutes! 5. Whole chicken- Will make creamed chicken over mashed potatoes, chicken noodle soup, and chicken roll-ups. Bake chicken in covered pan with a cup of water and seasoning of preference until done. Chop chicken into bite sized pieces. Make a rue of butter and flour and add a few cups of chicken broth and some black pepper and sage. Add chopped chicken. Serve chicken gravy over piping hot mashed potatoes. For the soup, just cook some chopped carrots, celery, and baby onions in chicken broth until tender. Then add cooked noodles and chicken. I use sage, marjoram, celery salt, and black pepper in this soup. The roll-ups are served cold and are wonderful on a hot day when you don’t want to heat up the kitchen. Butter flour tortillas with cream cheese or mayo. Add your pre-cooked chopped chicken and lettuce, tomato, and onions. Roll up and slice into pin-wheels. They will slice better if you leave them in the fridge for a few hours. 6. Sausage- Will make spaghetti, pizza, and ravioli. Brown sausage and drain fat. Add your favorite spaghetti sauce and serve over pasta. (Pretty self-explanatory.) For the pizza, make pizza crust. Recipe is available on this blog under “Versatile bread dough”. Top with the sausage spaghetti sauce that you already made. Then add your choice of toppings and mozzarella cheese. For the ravioli, use pre-made wrappers and fill with sausage. Seal raviolis with a little egg white or water. I like to crimp mine with a fork to make them look fancy. Drop in boiling water for five minutes. Serve with spaghetti sauce. 7. Turkey- Will make roast turkey, turkey pot pie, and turkey chili. Roast turkey according to weight with potatoes and carrots. Serve with turkey gravy made from drippings. Just make a rue of butter, drippings, and flour. Add milk, salt, and pepper. Sometimes I add a sprinkle of chicken base to make it pretty. Make a LOT of gravy. You will use it for your turkey pot pie by filling pastry with turkey, potatoes, carrots, and enough gravy to cover. Top with second pastry and bake until crust is flaky and golden brown. Be sure to cut slits in the crust. For the turkey chili just add a few cans of chili beans with liquid, chopped turkey, the gravy that you already made, onions, cumin and chili powder. Cook about 30 minutes until onions are tender. Posted by Createityourself on May 31, 2012 in Cooking and Baking, Project Center, Saving Money and tagged cooking, corned beef, ground beef, mexican food, pizza, pulled pork, recipes, reubens, saving money, saving time, slow cooker, tacos. What an ingenious way to save time, work and the pocket book! I have never come across a meal grouping plan like this. You have presented a selection of well thought out, simple and delicious meals. Well done! What creative ideas you have. I will have to try some of your recipes soon! all great ideas & wonderful time savers !